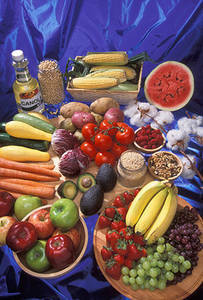 Description: Free picture of a table laid out with many different kinds of fruits and vegetables on a purple-blue satin back ground. There is also a bottle of canola oil, nuts beans, and some raw cotton. Photo taken by Stephen Ausmus for the U.S. Agricultural Resource Service.